This page shows chord print example usage of rpsoft 2000 software "musicord" for both keyboard and stringed instrument applications. To view the main page of this chord calculator windows software and view its main characteristics, view it here at: musicord. There are several ways to print from Musicord software: directly and indirectly. By directly you can choose to print directly from Musicord itself. In this case the printer used will always be the "default" printer attached to your computer. If you have multiple printers attached to your computer via a network and you wish to print on a different printer than the default printer listed in your windows printer control area, then you can choose to either print indirectly or to temporarily change the default printer in your windows control panel printer control. In both methods, direct and indirect, print and print characters are kept simple such that print should work with almost any printer. Indirect printing can be done by saving the printer file to your hard drive rather than printing it. Since it is simply a text file, using normal text characters, you can then load it into a word processing program of your choice and print it from there to a printer of your choice. You may also find that you can add words or change the appearance somewhat of the print if you wish using this indirect print method. If the characters do not line up well and seem off balance try using "Courier New" or a similar type as the font type. What "Courier" tends to do is to use the same amount of character spacing for all letters, which usually allows the characters to line up better. Sample print of a single guitar cord, printed in Courier New. Musicord will fit as many chords on a page as will fit comfortably, perhaps 8 or more. Sample print of a single keyboard chord. Note that an asterisk * shows the lowest keys that work for this chord, and that plus signs + show alternate fingerings for chord "inversions". For example, to play G minor 6th with D the low key, play all of the keys shown by an asterisk *. For playing D high instead, use the first D with a plus sign + instead of the D with the asterisk. Musicord will fit as many chords on a page that will fit - perhaps 8 or 10 in some cases. To see examples of multiple chords on a single page, click the following to either view or right click the following to save to your hard drive for view. 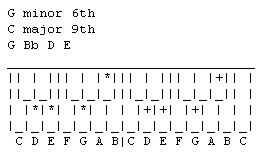 The following are two text page examples of chords that were done and saved with Musicord. Note the variety on the guitar chord example. On the guitar chord example, we decided to show chords on a left handed guitar done at the guitar neck (most common) but also one played down the fretboard, and then also one down the fretboard with a left handed guitar. Note that while a guitar is used for the stringed instrument example, that Musicord will also print chords for many other stringed instruments as well, including bass, banjo, ukulele, violin, mandolin, bouzouki, lute, and more. More information on the main Musicord software page here. Now available for both download or CD-ROM Shipment! $ 12.95 Download It Now from The Virtual Software Store using Visa, Mastercard, AMEX, Discover, a USA-based checking account, prepaid InternetCash(tm) Cards or your Microsoft Passport wallet. Immediately download and install it on your computer. Offline payment options also available. new CD ROM option ! $17.95 + $5.00 US for Shipping and Handling. Sales are via Pay Pal and include pay pal or many credit cards. Software program will be shipped to you shortly after the receipt of your order. CD ROMs will be shipped in a protective case for shipping and include instructions for loading.